Bye-bye Bebe. 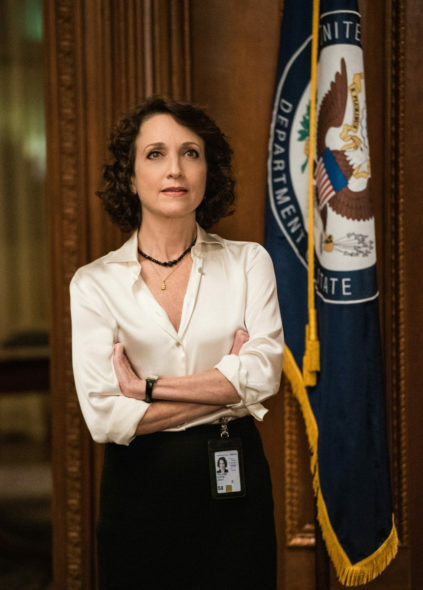 Bebe Neuwirth has exited the role of Nadine Tolliver, during the fourth season of the Madam Secretary TV show on CBS. The Cheers vet has played the Chief of Staff to Secretary of State Elizabeth McCord (Téa Leoni), since the TV series premiere in 2014. A political drama airing on the CBS television network, Madam Secretary also stars Tim Daly, Željko Ivanek, Keith Carradine, Sebastian Arcelus, Patina Miller, Geoffrey Arend, Erich Bergen, Kathrine Herzer, Wallis Currie-Wood, and Evan Roe. The story centers on Secretary McCord as she handles office politics, foreign diplomacy, and global deals. Neuwirth tweeted about her departure. Check it out. Madam Secretary co-star, Erich Bergen, tweeted out a fond farewell to his departing cast mate. What do you think? Are you still watching the Madam Secretary TV series? Was it the right time for Neuwirth to leave, of do you wish she was still with the series? Do you think this means it is likely Madam Secretary will be cancelled or renewed for season five on CBS? Madame Secretary is NECESSARY in today’s political climate. LOVE the guy who replaced her!!!!!! I wish more could have been done to keep Bebe on the show. I’m not happy with her replacement. Love the show and cast. Bebe will be missed. Newest cast member from Grey’s like her as an actress but her character on Madam too much! This character is ruining the show! I fast forward through all of her scenes. Will definitely miss this fine actress. I agree with the positive comments below, hope she has a great role coming up, and also that CBS finds a way to fill this cast opening. Frankly, I think Madam Secretary’s viewership is down only because people are so sickened by government these days that the show takes us back to reality when we really just want to escape… However, that being said, the show is extremely well-written and acted. Viewership is down because it went from 8pm to 9pm to 10pm. But it is still a Top 25 performer in L+7 viewership lift. Politics has nothing to do with it. Couldn’t disagree with you more about the quality of CBS! CBS has some of the best shows on television, especially their news shows, like Sunday Morning, Face the Nation, and the evening news. The one thing I do think is a little weird is the way they’ve chosen to schedule some things….Madame Secretary doesn’t seem like an end-of-the-night show….I think it should be reversed with the CSI show that currently comes before it. People are leaving CBS family alot these days. Its shows you have messed up this network is.Nobody wants to work for people that have no idea what they doing. CBS is going nowhere but south. I was shocked at Bebe leaving, but I admire the way she did it. Great show, but as is typical of CBS, they screwed this up this great show, just like they did with Hawaii 5-0. Last season they preempted it for inane award shows and what not, and moving it an hour later this year is annoying. I also do not like Henry being in the same business. He’s much more interesting with his own career. Bebe Neuwirth is a phenomenal actress and I am so sad that she decided to leave the show. I hope that she has a big starring Broadway gig coming up (I’ll never forget seeing her live on Broadway in “Chorus Line” and later in one of her Tony Award winning performances –“Chicago”). Not sure how Madam Secretary recovers from the loss of Bebe/Nadine. Still a fine cast- but Bebe was one of the main reasons I watched. I love this show and am very sorry to see Bebe go, she was definitely an asset to this show, I wish her the best of luck.. I was shocked to watch the episode on Madame Secretary this past Sunday. I love Bebe Neuwirth and she has mastered the role of Nadine so well. Integral part of the show. Loved her on other things as well. She will leave a huge hole in the cast and the program. I wish her well but wish she wasn’t going. Who will replace her?